DNB CET Admissions 2018 Exam Notice: Check DNB CET Admissions 2018 online as this page is dedicated to give all new alerts on DNB CET admission counseling 2018 in coming months, till you can see old orders. As National Board of Examination (NBE) invites online applications Diploma in National Board (DNB) admission through Centralised Entrance Test (CET) Exam 2018 for academic sessions June 2018. Last Date to submit application form DNB-CET is in 2018.The admission notification is published at natboard.edu.in. 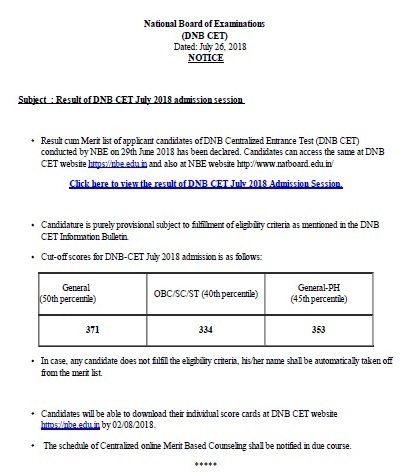 The DNB-CET exam is successfully taken by NBE from 2018. Further information of DNB Admissions 2018 regarding exam fee, dates, qualification, results, cut off marks, score card and application process is mentioned below………………………….. The candidate must have a MBBS Degree. 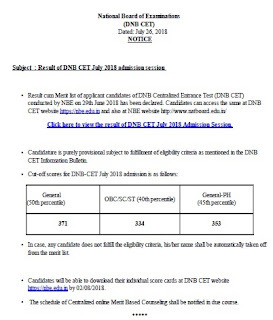 DNB CET Results 2015 Exam Notice: National Board of Examinations (NBE) will announce Diploma of National Board (DNB) CET exam results officially on 16 August 2015. 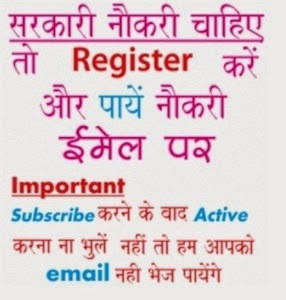 All appeared students can check DNB CET merit list 2015 counseling schedule at cet.netboard.edu.in. The entrance test was successfully taken on 01 to 04 July 2015 and candidates should gear up for DNB counseling in coming days. More information of DNB Results 2015 regarding merit list, counseling, cut offs is mentioned below…………………………..